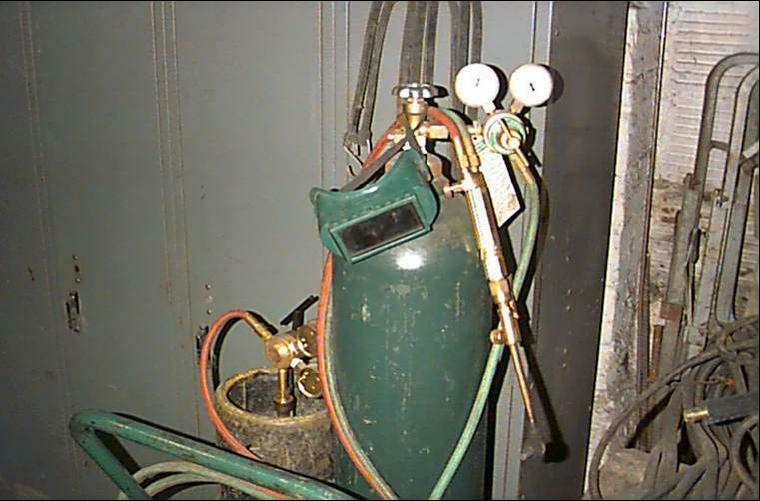 Step by Step instructions on how to safely setup and shutdown a oxygen acetylene cutting torch. Inspect the Oxygen tank, the Acetylene tank and the hoses for obvious damage. A quick leak check can be done by pressurizing the hoses and then watching the gauges to see if they drop in pressure. If the pressure readings drop, there is a leak. Do not check for leaks with a lighter. only use approved liquid leak check solutions. Make sure that main valves are off and the regulator pressure adjusting screws are backed out with no pressure readings on the gauges. Ensure torch valves are off. Stand to the side and s-l-o-w-l-y turn on the oxygen cylinder valve. Do not face the regulator while you do this. Once pressure reads on the gauge open up the valve all the way and back seat it. Always Always Always turn on the oxygen very slowly. Turning it on suddenly can actually make the regulator explode. Stand to the side and slowly turn on the acetylene or fuel gas cylinder valve. Open ½ to ¾ turn. Or slightly more if necessary to get a good reading. Purge each hose individually by opening the valves one a time for a few seconds. Now you are ready to light the torch: Open the acetylene torch valve bout 1/8-1/4 of a turn. Not opening the valve enough will cause acetylene black soot floaters . Using a torch striker, light the torch. Open the valve until the smoke just goes away from the flame and so that the flame is not jumping away from the tip. Now open the oxygen torch until the inner cone or cones define. Some brands like the Victor Cutting torch have instructions to turn off the oxygen first. Its always best to follow the instructions for the torch you are using. Inspect area and wait the appropriate time before leaving area.